Whether you’re a minimalist at heart, or you have a taste for the finer things, there are some simple ways to make your bedroom the ultimate sanctuary. Here are six modern bedroom trends that you should incorporate into your bedroom design. Some may say that wallpaper has been out of style for decades, but with a reinvigorated focus on unique styles and tasteful décor, it can make a big impact on your bedroom design. Rich and luxurious wallpaper can add that extra element of drama, depth or mystery to your bedroom. It can transform the room into more than just a sleeping space, making it a feature of the entire house. From acid patterns and bold retro murals, to vintage floral prints, 70s wallpaper designs are also coming back into fashion. You could even add your own modern touches by combining these eclectic designs with wooden surroundings or minimalist furniture. If you’re decorating your bedroom, or any room for that matter, creating the perfect contrasts is interior design 101. Luckily, you can’t go wrong with black and white. This classic combination isn’t just timeless, it’s also on trend. Whether you have white walls and a black duvet cover, or black walls and a white duvet cover, the combination will give your bedroom a classic feel. Experiment with the different features in your bedrooms, from the art and light fixtures, to the furniture and curtains. If you’re having trouble getting the balance right, you can always stick with just one of these two colours. The floral aesthetic is in bloom, and everyone has a taste for tropical design. When it comes to bedroom interior design, 2018 is turning out to be a colourful year. If you’re more into the relaxing aspects of nature, go for green colours and prints, or bring purifying plants indoors, such as the devils Ivy, Rubber Plant or Peace Lily. For those who are jungle-inclined, experiment with hanging prints that feature tropical leaves. You’ll find there are plenty of varieties that can achieve this vibe. It’s time to ditch your tired-looking old headboard for something a little more unique and sophisticated. You could go down the luxurious route with a velvet or jewel-toned coloured headboard. Or, you could get creative and go down the DIY path. For example, recycling an old door or wooden bench can give your bedroom a rustic chic look. You could also cover up the old headboard with an interesting vintage print or colourful wallpaper. Feeling adventurous? You could get rid of the headboard altogether and make the wall behind it a standout feature instead. Nightstands can be so much more than surfaces for lamps, books and glasses of water. Instead, they can be standout features that add glamour, luxury and sophistication to your bedroom. There are many shapes and varieties of luxury designs to consider. You could invest in sleek golden designs with lavish finishes and interesting curves. Or, you could go for designs that infuse elegant rocks such as limestone or dolomite. You could even shop around for vintage European nightstands from 19th and 20th century, or finely carved, custom wooden designs – it’s up to you. 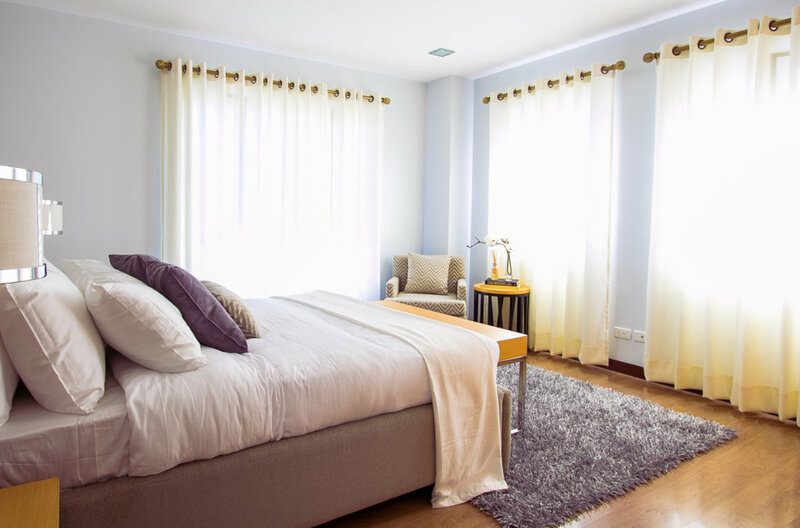 Minimalism has always been a popular approach for the more social areas of the home, but this de-cluttered and streamlined aesthetic has now crept its way into the bedroom. Features of minimalist bedrooms can include low-profile beds, greyscale colour patterns, and natural wood. Sleek and uncomplicated Scandinavian design is also popular with the minimalist look, as is concrete, exposed brick and expansive floor plans. Statement design pieces, such as Eames chairs, modernist prints or sculptural lamps, can give minimalist spaces an artistic element that draws your eye and adds interest to the room. Ready to design your dream bedroom? Your bedroom doesn’t have to be a design afterthought. It’s one of your primary living spaces, so it’s worth giving it the love and attention it deserves. At Kitome, our homes are designed to meet your needs. If you’re inspired by any of these emerging trends, and you want to incorporate them into the design of your new home – we can help. We supply kit homes across Australia and will help you design your custom kit home from the ground up. Get in touch to learn why a kit home is the right choice for you.